UDM Downloads > Deleted NTFS Files Recovery! NTFS data recovery software is simple yet powerful undelete utility to restore accidentally deleted, erased or missing files/folders from Windows partitioned disk on NTFS, NTFS5 file system. 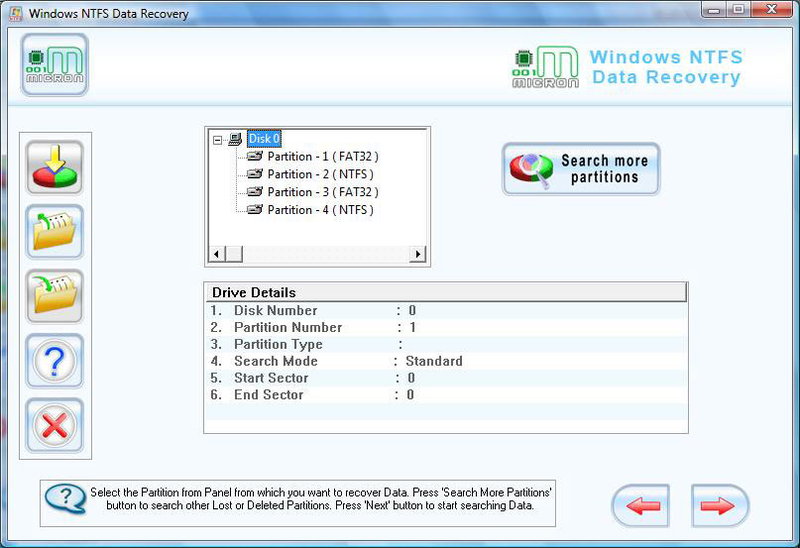 NTFS partition salvage application save lost data of your personal computer like partition table records, corrupted root directory detail and boot sector records of your PC can also be restored. NTFS file retrieval tool recall eliminated files folders and documents from IDE, EIDE, SCSI, ISCSI hard disk, PATA, SATA, ATA digital micro drives and other digital mass storage device. NTFS partition data recovery utility lets you re-access your accidently deleted gif, pdf, jpg, photo, movie songs, jpeg, pst, png photographs, pictures, power point slides, word and text files, excel sheets, access tables records and other MS office documents. Flexible and robust disk data rescue software revive the lost windows files even after the formatted or damaged disk drive, improper system shut down, power failure, deleted partitions and other data loss reasons. Award winning files rescue utility restore erased files after unintentional deletion or using Shift+Del keys and retrieves data when emptied recycle bin folder. Software Features: * NTFS data retrieval utility recovers lost, deleted, missing data including text, music, audio, video files and folders from partitioned hard disk drives. * Fully support all major hard disk brands including Seagate, Samsung, Western digital, Hitachi, Toshiba and other popular brands. * Easily restore accidentally deleted or lost files/folders from windows hard disk including SATA, ATA, PATA, IDE and SCSI disk drives. * Useful to recover data in the various fields like home, business, schools, banks, colleges, corporate sector and many more.